That’s Not at Disneyland! Or is it? Jeff and George review three books by Dominick Cancilla that offer some clever photos that might or might not be accurate. George: For this week’s Book of the WeeK, we’re checking out three books by our friend Dominick Cancilla. 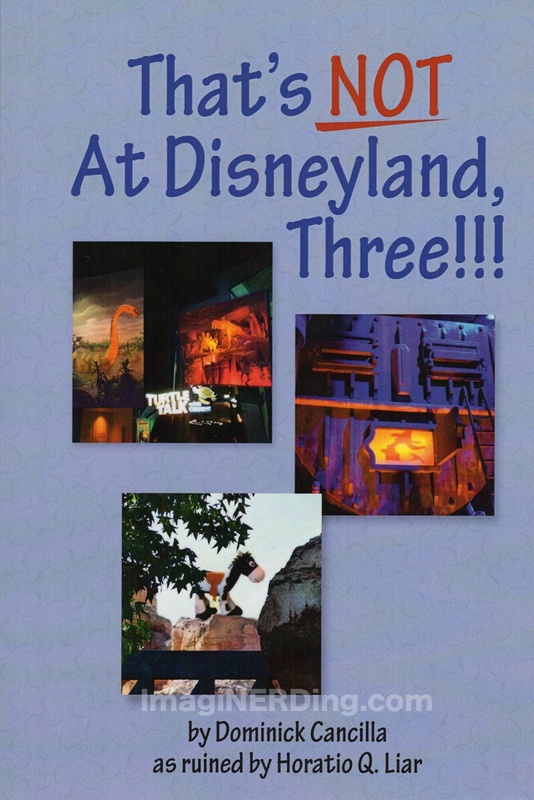 These are three books of Dominick’s vacation photos from Disneyland…and unfortunately, internet prankster Horatio Q. Liar (I think it’s pronounced Lee-arr—it’s French) got to the photos before the book was printed. Jeff: The books are aptly titled “That’s Not At Disneyland!” “That’s Not At Disneyland, Too!” and “That’s Not At Disneyland, Three!! 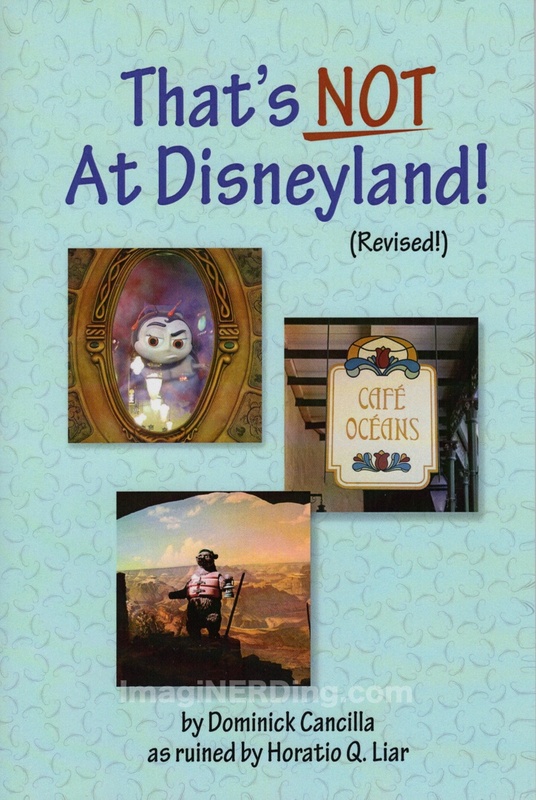 !” Mr. Liar has inserted fake photos from Disneyland all over the book, allowing for some pretty hilarious sight gags. It’s up to you, dear readers, to determine what is incorrect about the photos, and find out if you were right or not on the next page, where the correct photos lie. George: Basically, you get more than 40 photos from Dominick’s scrapbooks that have been altered by Mr. Liar. The doctored photos are on the front of the page and the actual photos are on the back side. It might seem like an odd concept, but it’s a great way for serious fans of Disneyland to check to see how well they know their beloved park. Jeff: Surprisingly, the photos threw me off more times than not. I often times had trouble determining what WAS altered and what wasn’t. However, when you notice, they are usually hilarious in nature, and show Cancilla’s keen eye for humor when it comes to the Parks. George: The books reminded me a lot of the Where’s Waldo series, but with Disney details. Sort of. It really shows off how well some people can use photo manipulation programs. Because we don’t have a sponsor that rhymes with motopop. The books can be seen as fairly expensive, but I think most Disneyland fans will appreciate the humor. Jeff: There maaaay even be a sweet little reference to everyone’s favorite greatest online show in them, as well. Specifically the first book. Now, that isn’t why we are so inclined toward them, but it DOES help! George: On a final note about the book, Dominick has included a reference to all of the photo notes in the book. Basically, for those of us not as familiar with Disneyland he’s given us a hand reference to everything that Mr. Liar changed! 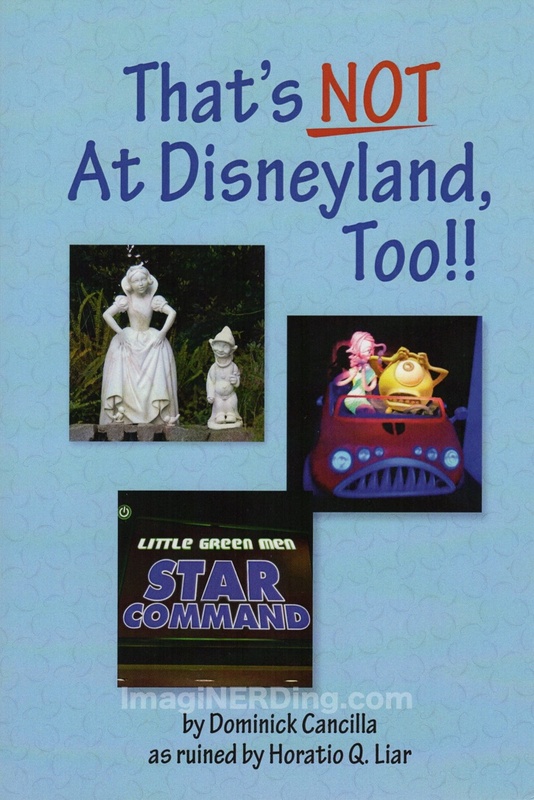 I do have to admit that I found the book to be a fun distraction and an interesting way to look at Disneyland. Some of the photo changes were easy and some were quite difficult! Jeff: If you’re a Disney fan, you’ll get a kick out of these books, for real. They are fun and entertaining, and provide a little something different than from what you are used to. Think you know Disneyland inside and out? Then Check out That’s Not at Disneyland!